Rocky Mountain Signing Company is now your supplier of concrete barricades for rent. We carry temporary Type 7 concrete barricades for rent to protect your work zone. Each section weighs 4,400 pounds, is 10 feet in length and meets all CDOT requirements. A concrete barrier is a great choice to protect your excavation project while keeping motorists who drive through your job site safe 24/7. Concrete barricades are great for traffic control but they have many other uses as well. Concrete barrier rentals can also be used to protect your stock-piled material and equipment from theft or damage. You can use concrete barricades to protect your structures and other property by blocking driveways and other access points. Rocky Mountain Signing Company can load sections on to your trailer. Don’t have a trailer? We have experienced installation crews ready to deliver the barrier directly to your site, set it, and pick it up when you are finished. If you're looking for concrete barrers for rent, Rocky Mountain Signing Company can provide concrete barricades to you monthly, one section or more at a time. Contact Rocky Mountain Signing Company for the concrete barricade rental Colorado crews depend on. we also provide professional installation services to get your signs securely in place. 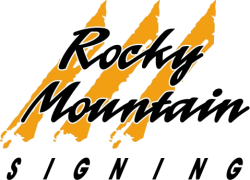 Rocky Mountain Signing is a traffic control company offering traffic control equipment rentals. This includes attenuator trucks, message boards, concrete barriers, and certified flaggers. We service several areas in Colorado, including Parker, Denver, Aurora. Littleton, Englewood, Lakewood, Highlands Ranch, Castle Rock, Larkspur, Monument, & Colorado Springs. Contact us today for all of your traffic management needs!